How does this relate to you as a trade show exhibitor? It’s possible the tables are being turned on you, too. You might be making assumptions about visitors to your trade show booth. Assumptions that can have your booth team working hard to sell to visitors that aren’t interested. Assumptions that make it difficult to convince your visitors that your product or service is the answer to their problem. To start with, those “customers” may not be. Customers, that is. Just because they stopped at your booth, it doesn’t mean they’re really qualified customers. And if they’re interested in your products, it doesn’t mean they know anything about you. Be careful not to give your customers credit for knowing too much about your company, your product or your service. This problem can easily affect your company’s bottom line. If this is happening in your trade show booth, your marketing messages won’t make sense to a large percentage of your prospects. If you assume your prospects know more than they do, your communications could go over their heads. Or on the flip-side, you’ll waste your messaging by telling them what they already know, or don’t need to know, while you’re skipping over essentials they still don’t have. But they’re too polite (or scared) to admit they don’t know. It’s never a good idea to talk down to your prospects. Take the time to understand your customers and don’t make the mistake of assuming what they know. Or by assuming they’re interested. The problem is, your prospects probably won’t tell you if they don’t understand you. If you don’t solve this problem, prospects will buy based on what limited information they do have. Or they’ll find another supplier that will give them the information they need, the way they need it, so they can make informed buying decisions. 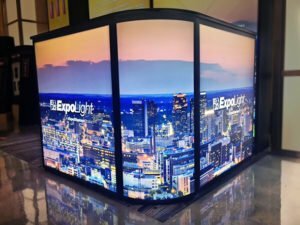 Backlit Trade Show Counters help attract attention! 1) Slow Down: Practice providing more background information and context when communicating with attendees. This can happen through your exhibit graphics, your product literature, or in the face to face communication your trade show booth staffers have with prospects. One way to understand your customers is to stop and ask questions of your visitors to make sure they’re following your explanation of your product or service. If you pause and listen to their replies, you and your booth staffers will learn how to tailor your sales message to each particular audience. In the commercial, the “financial advisor” threw around some industry terms like “equities” and “asset allocation.” None of the people stopped to ask, “What does that mean?” Your industry probably has similar terminology that you understand completely. But your prospects may be clueless, or at least limited in their understanding of that jargon. Learn to understand your customers by eliminating any industry specific words and acronyms. Make the information clear enough—and jargon-free enough—so that a twelve-year-old could understand it. Again, this doesn’t mean you talk down to your prospects. It simply means you communicate with them in the most basic terms possible. Doing so takes the pressure off the attendee, who doesn’t have to admit not understanding. The clearer and simpler you can be, the less your prospects will have to ask your staffers to explain themselves. Economical Embrace Stackable SEG Pop Up Displays – Set up in 10 minutes, stack to 16ft tall! Wouldn’t it be great if, every time you talked to a professional, you had a translator at hand to help you understand what he or she was saying? Or maybe some tool that gave you examples of how to apply what the professional was explaining to you? You can get to understand your customers and help them understand more by giving them several ways to learn about your company and its products or services. Besides printed materials, let prospects find out more by visiting your website, following you on Facebook or Twitter, or on an app for their mobile devices. These digital tools also give you more ways to understand your customers and to connect with prospects, helping you forge deeper and more rewarding relationships. At American Image Displays, we understand our clients aren’t really looking to buy trade show displays – they’re looking to improve their sales at trade shows. We can help by making your trade show graphics communicate clearly to your customers. And by helping provide a trade show booth that does exactly what you want it to do. We offer a variety of tools for making a great impression on trade show visitors. Representing virtually every major trade show exhibit manufacturer, we’re able to create a trade show booth that helps you tell your story clearly and memorably. Let us show you how. Call us at (800) 676-3976 or email [email protected]. For more, check out 3 consumer-centric trends you need to know or how to maximize your results with direct mail.